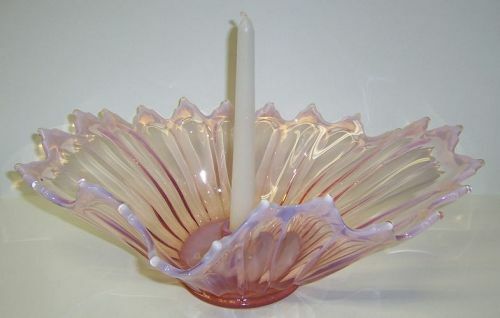 This is a really pretty pink opalescent Heirloom Console Bowl with center Candle Holder made by Fostoria Glass. This console bowl measures 14 inches long X 8 1/2 inches across X 4 1/2 inches high. It is in excellent condition with no chips or cracks. Be sure to search our other Fostoria glass available. We guarantee items to be as described. THANK YOU. 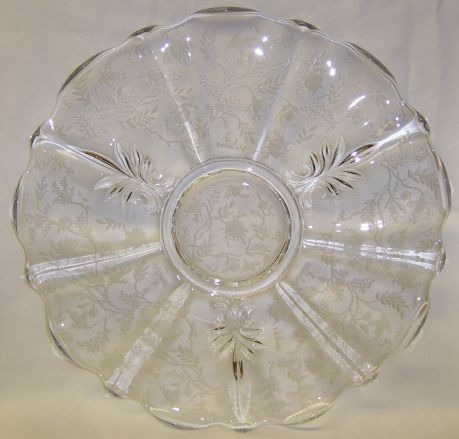 This really pretty crystal Chintz 13 3/4 inch Upturned Edge Torte Plate was made by Fostoria Glass. This Torte Plate is in very good condition with no chips, cracks or scratches. Be sure to search our other Chintz available. We guarantee all items to be as described. THANK YOU. This is a really pretty pink Drape Swag and Diamond 9 Inch high Vase made by Fostoria Glass. This Vase measures approximately 3 inches in diameter and is in very good condition with no chips or cracks. Be sure to search our other Fostoria glass available. 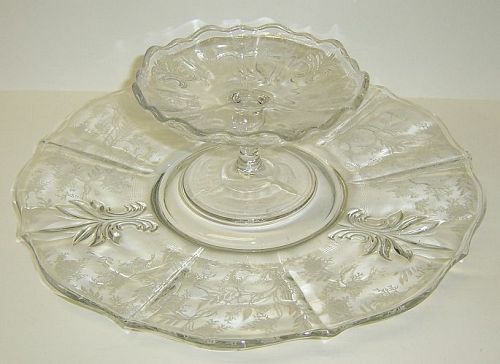 This really pretty crystal clear Heather Oblong Pickle Dish was made by Fostoria Glass. The Pickle Dish measures 8 1/4 inches long X 4 inches wide X 1 1/2 inches high. It is in very good condition with no chips, cracks or scratches. Be sure to search our other Heather available. We guarantee items to be as described. THANK YOU. 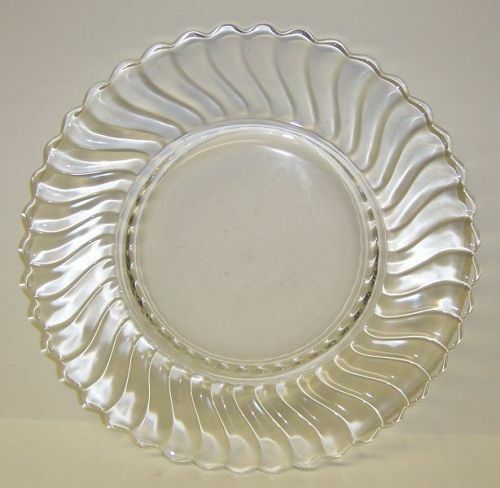 This really pretty crystal clear Heather 5 inch high Footed Sherbet Dish was made by Fostoria Glass. This Sherbet measures 3 3/4 inches in diameter and is in very good condition with no chips, cracks or scratches. Be sure to search our other Heather available. We guarantee items to be as described. THANK YOU. 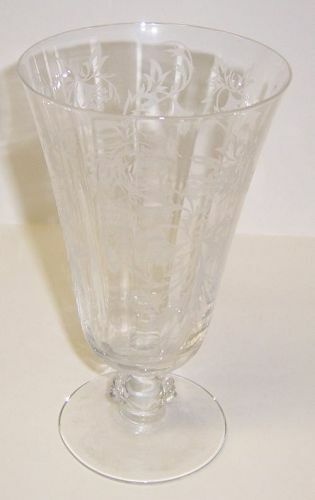 This really pretty crystal clear Heather 6 1/8 inch high Footed Tumbler was made by Fostoria Glass. This Tumbler holds 12 ounces and measures 3 1/2 inches diameter at the top. It is in very good condition with no chips, cracks or scratches. Be sure to search our other Heather available. We guarantee items to be as described. THANK YOU. 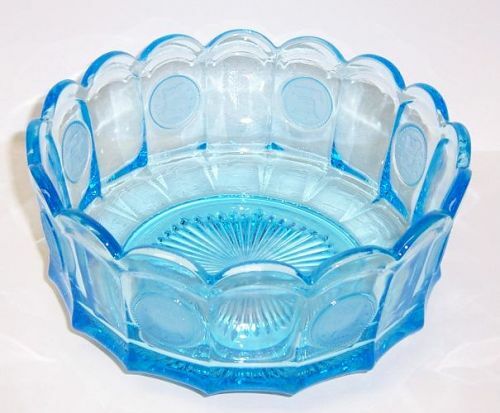 This is really pretty Crystal clear Heather 2 Handled Upturned Muffin Tray was made by Fostoria Glass. This Muffin Tray measures 9 1/2 inches X 8 inches across from handle to handle. This Tray is in very good condition with no chips, cracks or scratches. We guarantee all items to be as described. THANK YOU. 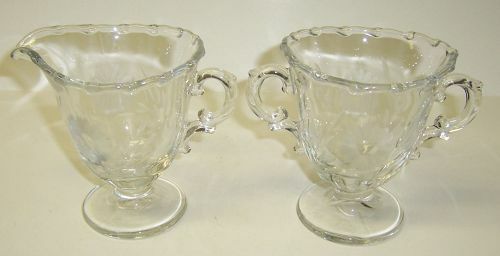 This really pretty crystal clear Heather Small Creamer, Sugar Bowl and Tray were made by Fostoria Glass. The creamer and sugar each measure 3 1/4 inches high. The Tray measures 7 inches long X 4 inches wide. 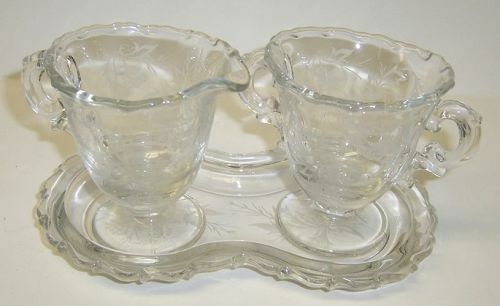 The Creamer, Sugar Bowl and Tray are all in very good condition with no chips, cracks or scratches. Be sure to search our other Heather available. We guarantee items to be as described. THANK YOU. 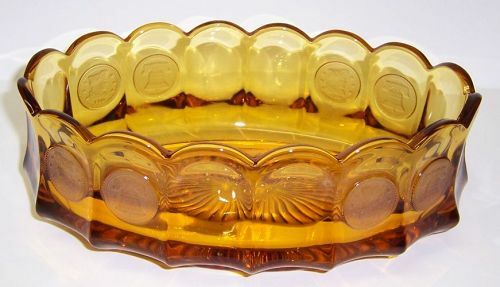 This really pretty amber Coin 8 3/4 X 5 1/2 Inch Oval Vegetable or Serving Bowl was made by Fostoria Glass. This Bowl has the frosted coins and is in very good condition with no chips, cracks, scratches or cloudiness. Be sure to search our other Fostoria Coin available.